I was first introduced to Salted Caramel Rice Krispies Treats by my friend Eunice. Eunice is an amazing home cook. 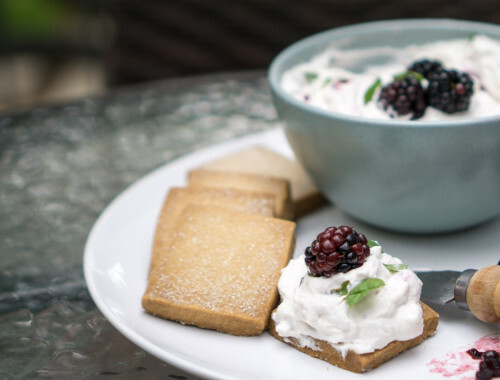 She can whip up a six-course meal for six guests at the drop of a hat (not just easy stuff: complicated dishes like paella, Korean beef short rib stew, double-fried wings, multi-layered dessert fantasies). With her talent, efficiency, and intuition for what tastes good, she would probably not feel out of place in a busy restaurant kitchen. True to form, Eunice supplied an entire dessert table at our friend Jenn’s recent baby shower, baking everything only the night before. There were chewy blondies packed full of chocolate chips and nuts, classic chocolate chip cookies, cocoa brownies, gooey espresso-iced brownies, and cinnamon-dusted snickerdoodles. Everything was executed perfectly, as usual. Yet the one thing that disappeared the fastest was likely also the easiest to make: Salted Caramel Rice Krispies Treats. First things first. 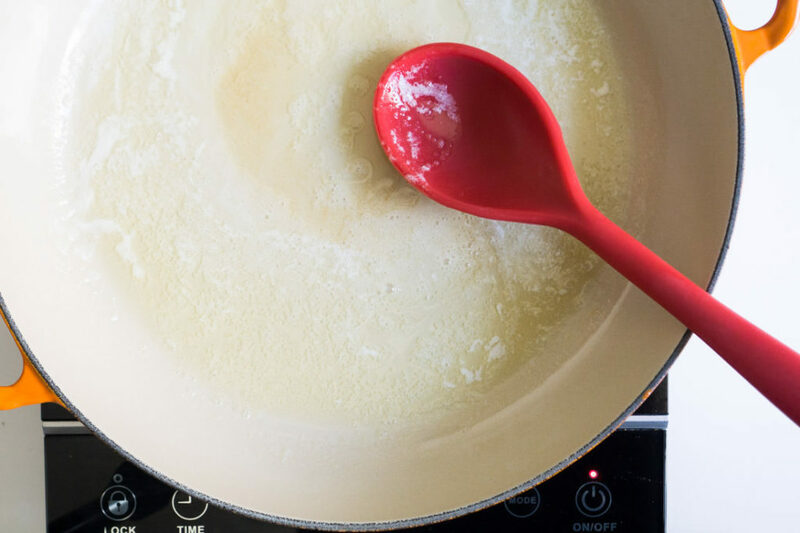 Melt the butter in a wide saucepan. 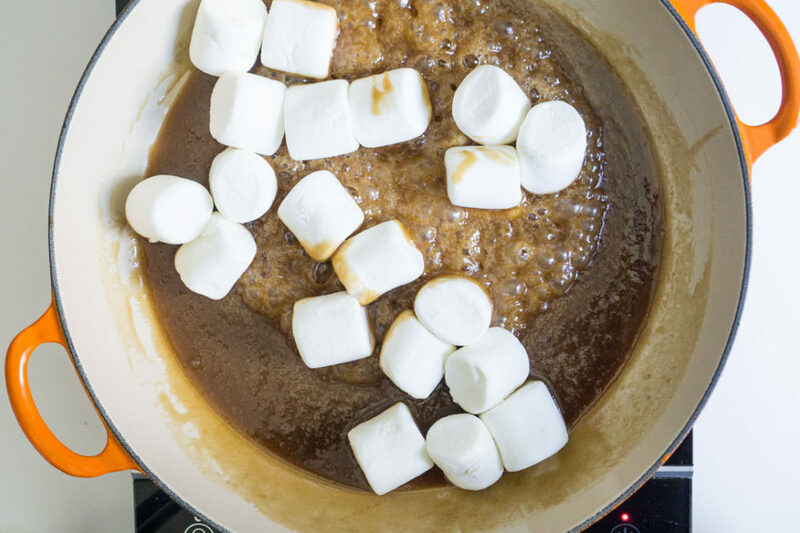 I recommend using a silicone spatula or spoon for all this cooking: melted marshmallow gets real messy, real fast. Toast the butter. 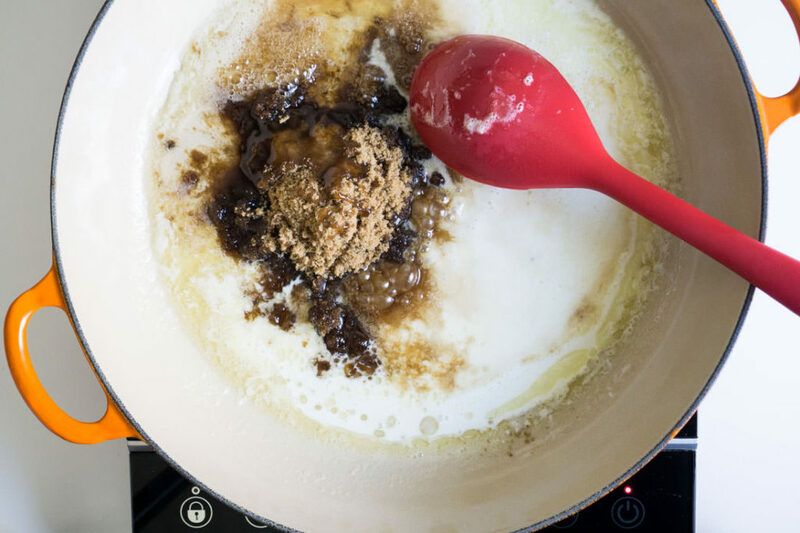 Yes, browned butter smells (and tastes) like heaven. Add your brown sugar, cream, and corn syrup. Corn syrup (not the same as the much-reviled high-fructose corn syrup) serves a couple of important functions here. 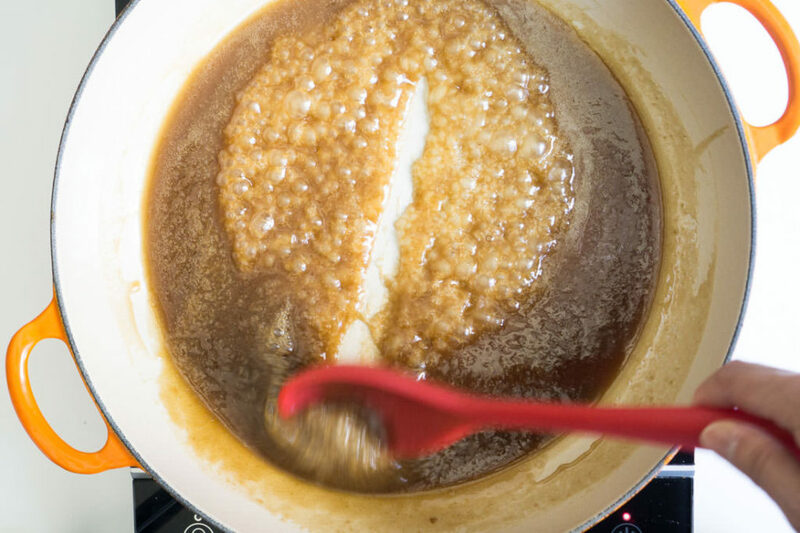 It not only helps to prevent the caramel sauce from crystallizing when stirred, it also lowers the caramelization temperature. So don’t forget the corn syrup. 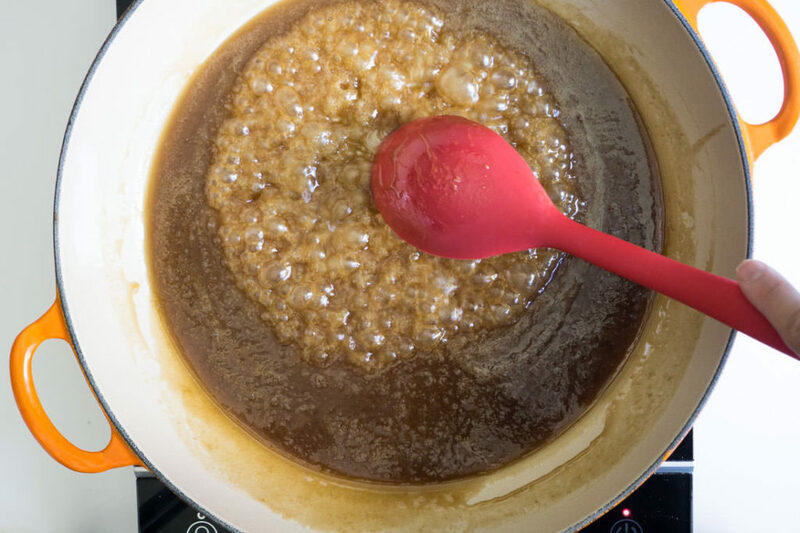 …about 4-7 minutes later, you will notice that the syrup has thickened, and you are able to drag a clean line through the syrup with your spoon. Stir in the salt. Lower the heat to the lowest setting and add the 10-ounce bag of marshmallows. 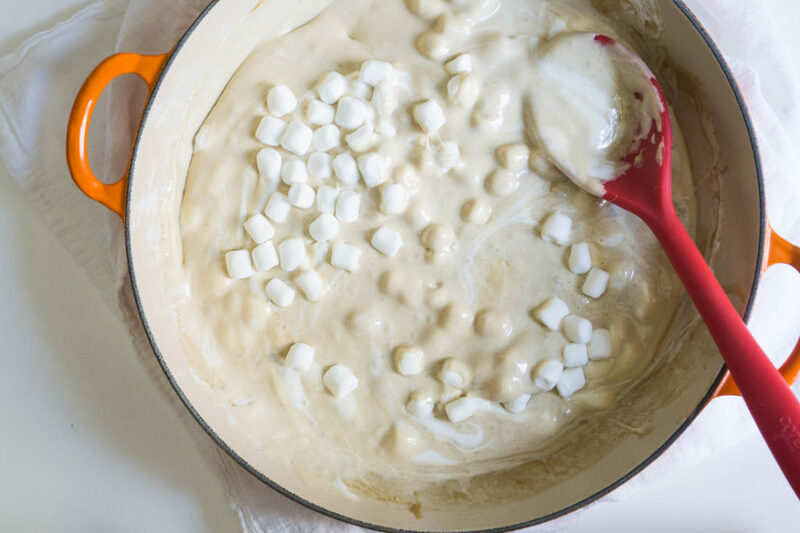 I had only odds and ends of marshmallows–a little bit of the large kind, a little bit of the mini kind–so I weighed out 10 ounces worth of marshmallows and first added the large marshmallows to the mix, knowing that they would take a little more heat and coaxing to melt. Then I added the remainder of my 10 ounces of marshmallows (the minis, this time) and stirred until they melted into a lovely marshmallow goop. Remove your marshmallow mixture from the heat. At this point, you have two options. 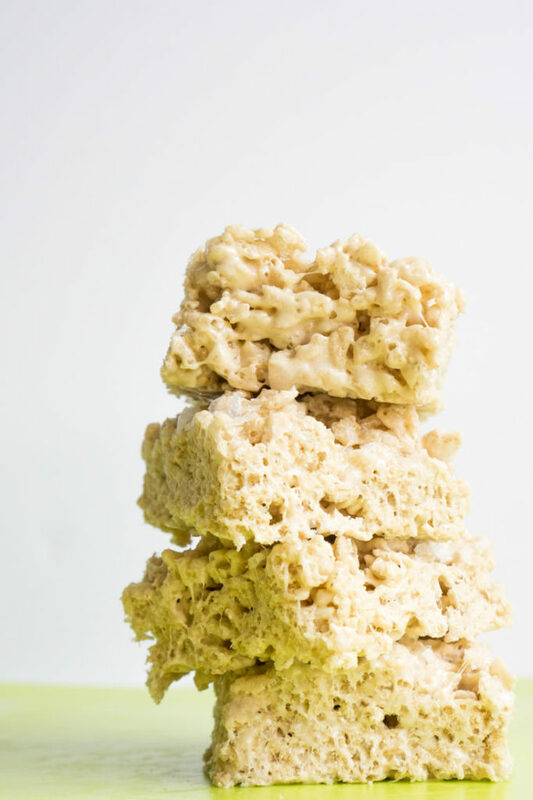 If you want a Rice Krispies treat with a smooth marshmallow mixture gluing the cereal together, you can add the remaining cup of mini marshmallows immediately. If you want a Rice Krispies treat with little chunks of marshmallows inside, wait a couple of minutes before adding the final cup of marshmallows. 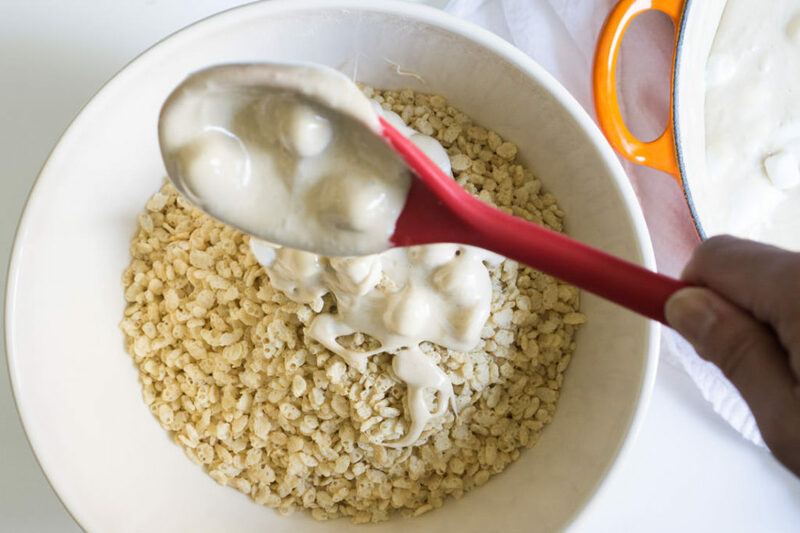 Stir the marshmallow mixture into the bowl of Rice Krispies. Work fast! The mixture hardens quickly. 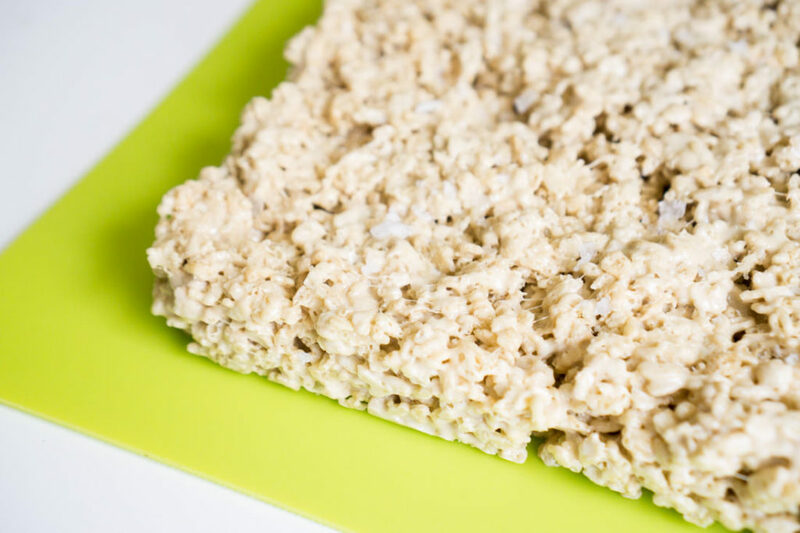 Press the Rice Krispies mixture into a greased 9×9-inch pan. Gently press the mixture into the pan with a piece of parchment paper sprayed with cooking oil. Don’t press too hard, or else you’ll get Rice Krispies bricks. Now for the all-important finishing touch! Sprinkle a little more flaky Maldon salt on top. I recommend anywhere from 1/2 teaspoon to 1 teaspoon of a flaky salt. 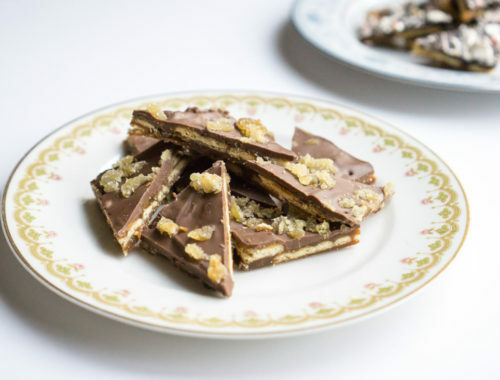 The thin flakes of salt really balance out the sweetness of the treats. 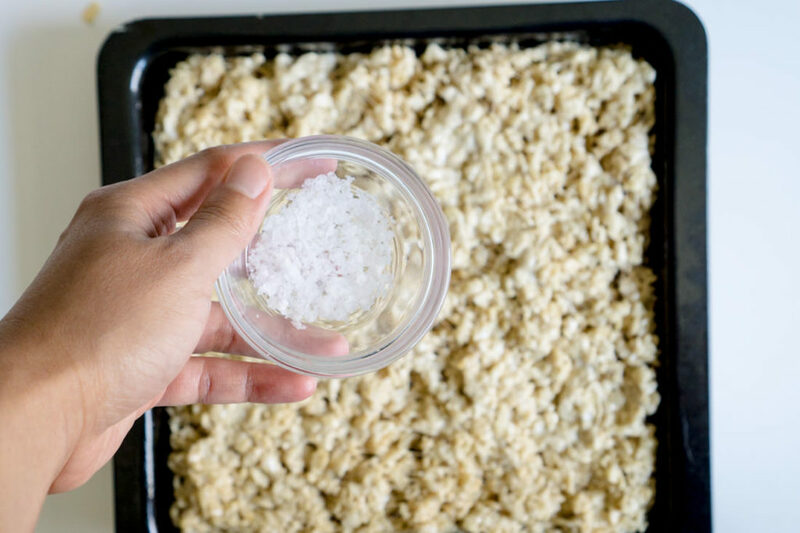 If you don’t have access to Maldon or another flaky salt, I recommend skipping the salt topping–fine sea salt would disappear into the bars rather than perching on top, and normal coarse sea salts or Kosher salt would be unpleasantly chunky. 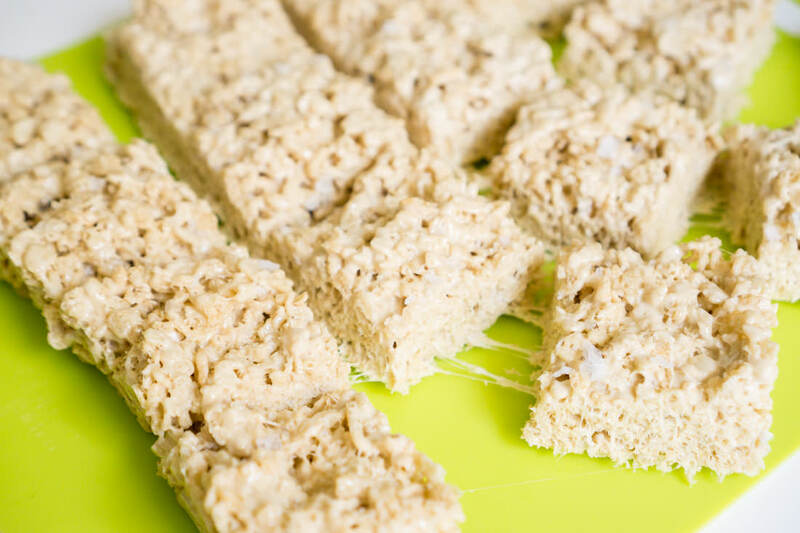 Let the Rice Krispies treats cool, and carefully pry out of pan with a spatula or butter knife or somesuch. Cut into squares. Pull apart and eat, reveling in these better-than-childhood-memory treats. It’s good to be an adult. Spray an 9-inch square cake pan with nonstick spray. 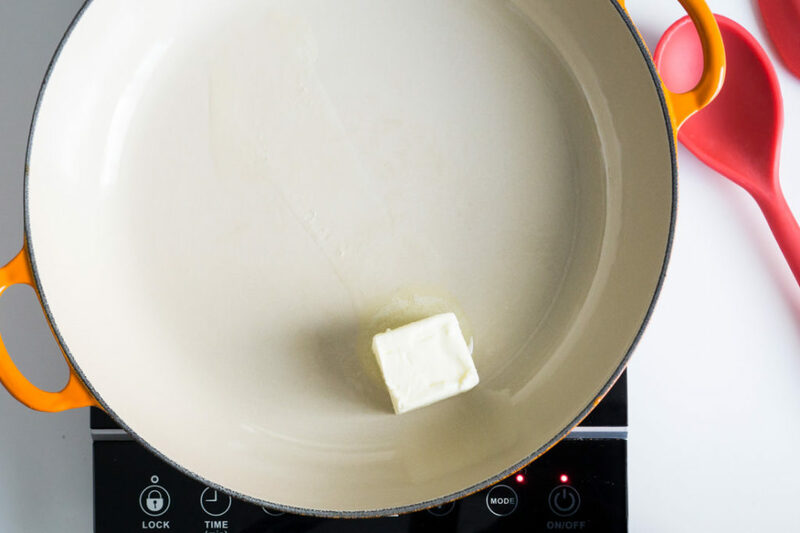 Add the butter to a medium saucepan over medium-high heat. Cook until butter turns a light brown color and develops a nutty, toasty scent. Stir in the brown sugar, heavy whipping cream and corn syrup. Cook until thick and syrupy while stirring frequently, about 5-7 minutes. Stir in the salt. 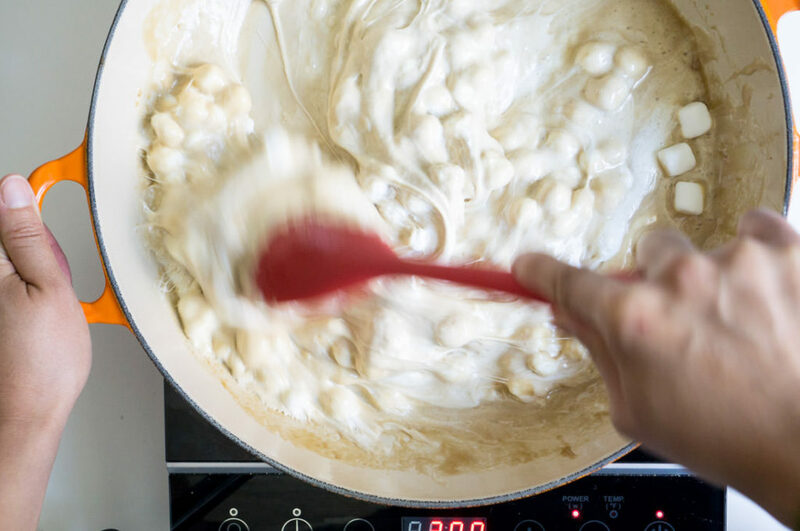 Turn the heat to the lowest setting and stir in the 10-oz bag of marshmallows, immediately removing the marshmallow mixture from the heat when it is smooth and melted. If you'd like a totally smooth marshmallow mixture, add the remaining cup of marshmallows now and stir until melted. 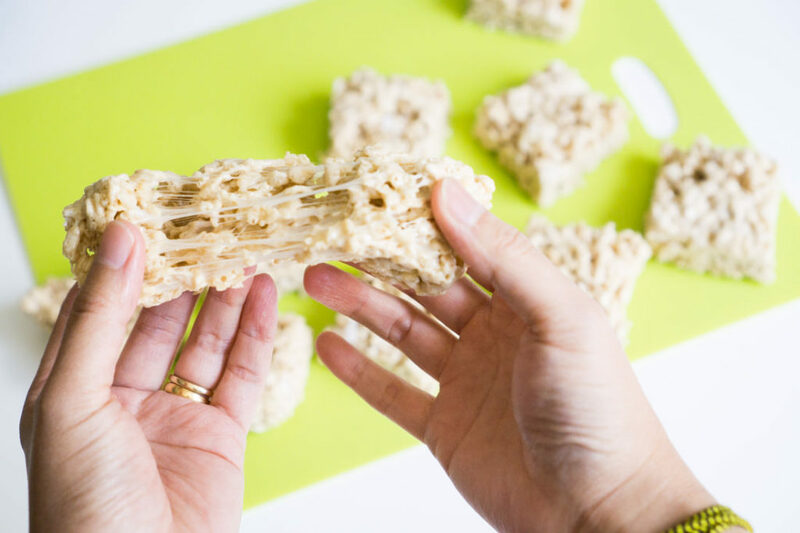 But if you'd prefer chunks of marshmallow in your Rice Krispies treats, wait a minute or two for the mixture to cool down before stirring in the remaining cup of marshmallows. 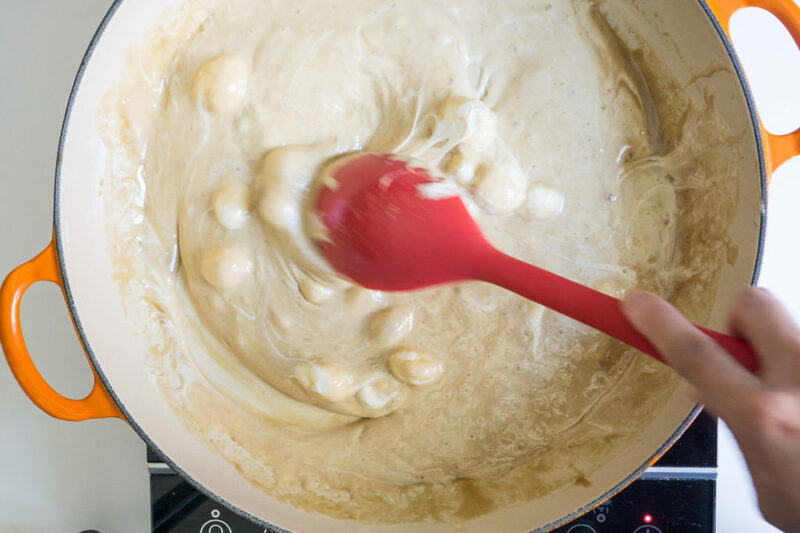 Quickly pour the caramel marshmallow sauce over the cereal and stir all together. 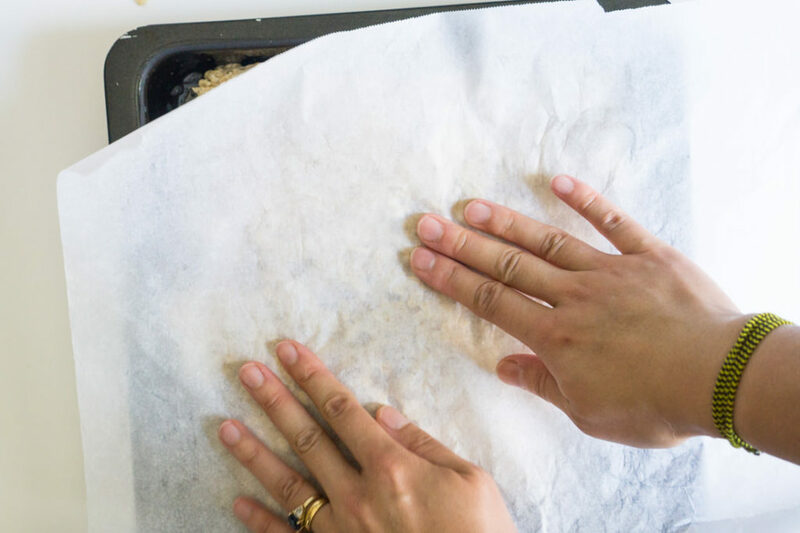 Pour into the prepared pan and press down with a piece of parchment paper sprayed with nonstick spray. 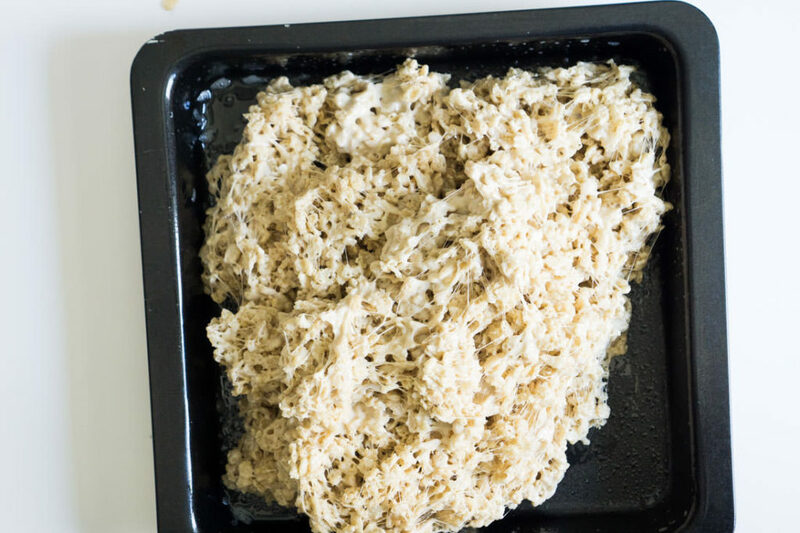 Take care to press lightly; if you press too hard, you will get dense, hard Rice Krispies treats. Sprinkle lightly with flaky sea salt. Cool completely, and then cut into squares, oiling your knife if necessary to prevent sticking. 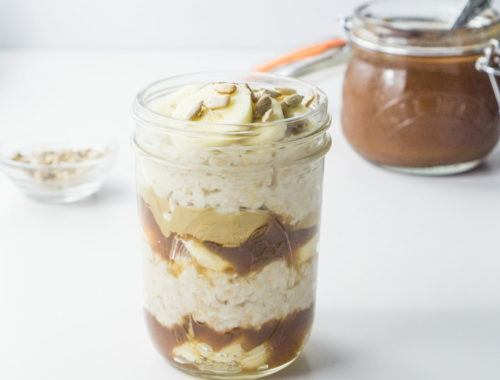 Adapted from Salted Caramel Crispy Treats, by Jamie Deen.